As I prepare to further my Reiki training, I have been studying the principles of Reiki and realised how closely they link with Mindfulness and present moment awareness. Dr Mikao Usui developed the five principles of Reiki (or the 5 Reiki intentions) to help us gain the most from Reiki and understand the ancient secret method for gaining happiness. Dr Usui believed that applying the five principles or intentions in our lives, in conjunction with Reiki practice, helps to increase our wisdom, compassion and inner strength. 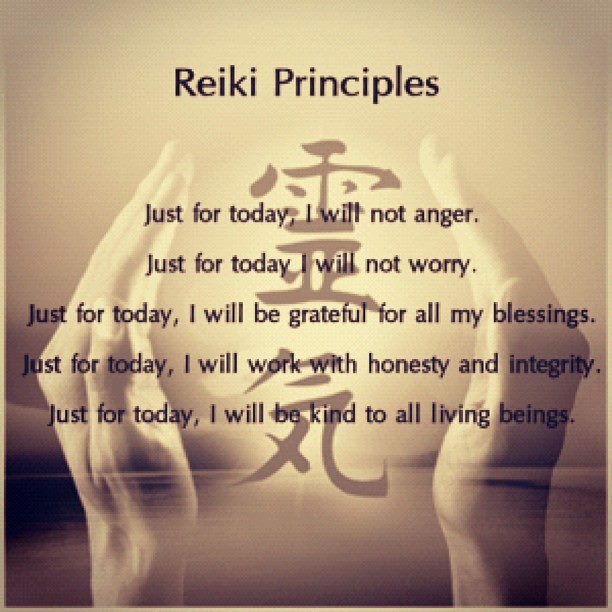 The appealing aspect of the Reiki principles is that we only have to think about today. The thought that it is “just for today” can often make any difficult or daunting life experience seem manageable. Maybe when we are making a lifestyle change such as stopping smoking or dieting, the prospect that we might never smoke another cigarette again or will have to go for weeks without our favourite food, seems unbearable. If we bring more present moment awareness to the experience and remind ourselves we only have to do this today, and tomorrow is a new day, things somehow feel more achievable. This fits in nicely with the mindful approach to living and present moment awareness. Our tendency to be carried away by our thoughts into future events or fears is a common source of stress. Reminding ourselves of these intentions, and living just for today brings us back to the now. I found these intentions particularly helpful when I was grieving for a very dear and beloved grand parent. I found it over whelming that I would never see her again. Imagining my whole life stretching out before me without her in it seemed frightening and heart breaking. Just thinking about it in these terms now as write, makes my heart race and my eyes fill with tears. But, if I ask myself will I be OK if I just don’t see her today? The answer is yes, just for today I will be OK without her. So if you are grieving, trying to change a habit or stuck in a job that you dislike and are feeling stressed about spending the next few months there, ask yourself, can I do this just for today? The answer will probably be yes. You might think that this approach may prevent you from moving forwards in life or changing unhappy circumstances, however, when you remove the stressful thoughts of a future that hasn’t arrived yet, you achieve some mental clarity and space to take positive action.